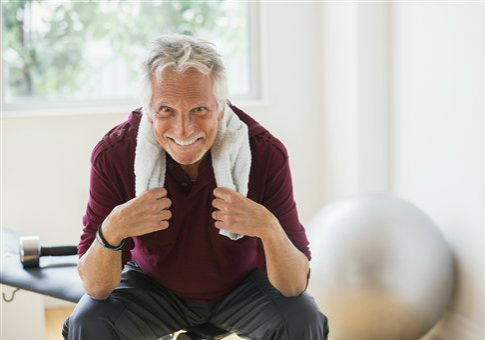 The Department of Health and Human Services is partnering with an advocacy organization that is asking gay men to send selfies from the gym to promote Obamacare. The agency announced Tuesday it was joining with several lesbian, gay, bisexual, and transgender groups to encourage the LGBT community to enroll. "As part of LGBT Week of Action from Dec. 7 – 11, Out2Enroll and other organizations will hold enrollment activities and provide in-person assistance across the country," the department said. "Additionally, partners will leverage social media campaigns to ask their members and affiliates to sign up for an affordable health plan for 2016 through the Health Insurance Marketplace." One social media campaign started by the agency’s main partner, "Out2Enroll," is #HealthySelfie. "We’ve showed [sic] you ours, now you show us yours," the group’s Facebook post reads, featuring mostly images of men at the gym. 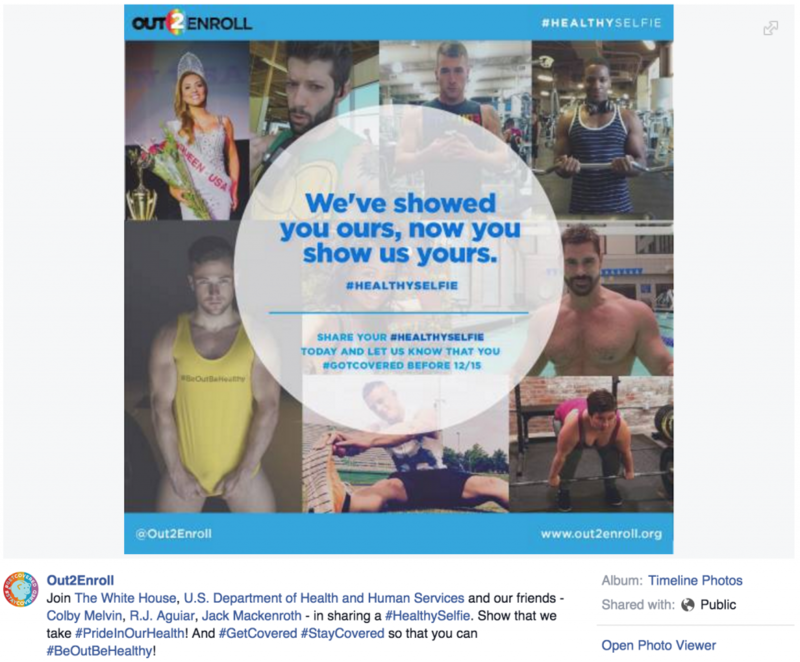 "Join The White House, U.S. Department of Health and Human Services and our friends -Colby Melvin, R.J. Aguiar, Jack Mackenroth – in sharing a #HealthySelfie," the caption read. "Show that we take #PrideInOurHealth! And #GetCovered #StayCovered so that you can#BeOutBeHealthy!" Colby Melvin is a "Designer, Model, [and] Activist" who recently modeled for Cheap Undies. R.J. Aguiar is founder of "Not Adam and Steve," an LGBT advocacy group. Jack Mackenroth is a spokesperson for an HIV education campaign and former contestant on the reality series Project Runway. Mackenroth and Aguiar have posed for selfies for the campaign. Jason Carter, a member of RuPaul’s pit crew, a "group of scantily clad muscular men who appear on all seasons of RuPaul's Drag Race," has also posed. Sylvia Burwell, the Health and Human Services secretary, praised the partnership with Out2Enroll. "This administration has made historic progress for the LGBT community, ensuring that people cannot be denied health coverage because of their gender identity, sexual orientation, or pre-existing conditions," she said. "We are proud to continue that progress and work with our national partners to give more LGBT Americans and their families access to quality, affordable health coverage." Out2Enroll was created in 2013 and began partnering with the government to promote the law. "During Open Enrollment, Out2Enroll will support in-person events across the country by participating in local LGBT Prides and town halls, providing LGBT-specific enrollment materials to partners, and hosting administration surrogates," the agency said. "Out2Enroll will also continue to provide in-person and online training sessions on LGBT cultural competency and enrollment issues for assisters, including Navigators, Certified Application Counselors (CACs), and agents/brokers." "Health is an LGBT equality issue—we all deserve to be healthy and to get the help we need to protect ourselves and our families," said Kellan Baker, steering committee member at Out2Enroll, who is a senior fellow at the liberal think tank the Center for American Progress. "Our community has seen historic changes this year, such as marriage equality and new nationwide nondiscrimination protections for LGBT people in health care." "By taking advantage of the financial help that’s available and getting covered by December 15th, we can all make sure that we’re able to celebrate these advances for years to come," he said. The government is partnering with other advocacy groups, including Services and Advocacy for GLBT Elders, the National Center for Transgender Equality, and the Human Rights Campaign. The #HealthySelfie campaign has yet to take off. This entry was posted in Issues and tagged Health Care, HHS. Bookmark the permalink.